Step into Gallery 1 at Penlee House, and you will be enfolded in the languorous embrace of an endless Edwardian summer. On every wall is a delectable array of paintings celebrating Laura Knight’s joy at finding herself in Cornwall. After the challenges of life in the harsh environment of the Yorkshire coast, Laura and her husband Harold moved to the south west in 1907. As I glanced through the obituary section of The Guardian on a Saturday in March, my attention was drawn to a son’s tribute to his mother, Moreen Moss. While her name was familiar to me from my work as an editor of the Cornwall Artists Index, I could find only one image by her online – a painting entitled ‘The Trawl’. The Digital Museum of Cornish Ceramics revealed that Moreen’s husband Bernard was a potter of renown, based in Mevagissey. Contemplating the courses on offer at Newlyn School of Art, I wondered if my habit of blogging was just a way of taking refuge in the written word. Was it a bit unfair to write about artists without ever experiencing, albeit briefly, a sense of the angst and excitement involved in the creation of an artwork? While titles such as ‘Cornish Landscape’ or ‘Watercolour’ sounded tempting, I soon had second thoughts. As one who is afflicted by instant paralysis at the prospect of making a mark on paper with a pencil or brush, I feared that either of these courses might reduce me to a nervous wreck. 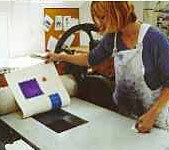 Eventually I settled on the two-day Introduction to Printmaking – a process whose mystique had always intrigued me. 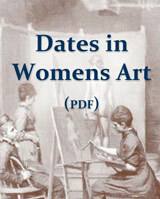 In December 2010 a canvas by the late Rosemary Ziar was presented to St Ives Library, on loan from her family. Entitled ‘Portreath 1974’, it hangs alongside works by her contemporaries Ben Nicholson, Wilhelmina Barns-Graham and Bryan Pearce. That this painting has found a new home in St Ives is entirely appropriate. Elizabeth Rosemary Rowe, whose birth in the nearby Sheaf of Wheat pub in 1919 entitled her to describe herself as a ‘hake’*, came from a family with a long tradition in tin mining and farming. Her maternal grandfather was Madron Trembath, who had been the mine captain at Geevor. After his premature death her grandmother married Thomas Job, the licensee of the pub. Her aunt, Mabel Trembath, was a colourful figure who helped out behind the bar. Mabel lived to a great age and recalled serving D H Lawrence and his wife on their regular visits to St Ives from Zennor during the First World War. Lawrence was a conscientious objector and Frieda was German, so the couple were viewed with a great deal of suspicion by the locals.